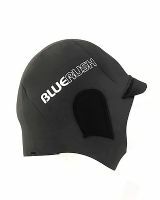 Our neoprene wetsuit hoods provide extra warmth to the head in the water. Hoods are available in sizes: Small, Medium, Large and Extra Large. As a guide a small hood would suit a young or small adult with a small head and an adult man with an average sized head would suit a large hood. Our Blue Rush hoods are manufactured to a high standard. They are made from 2.5mm neoprene and have flat locked stitching for strength in the seams. The hood has ear membranes for hearing. The hood has a peak at the front to help with glare and spray.